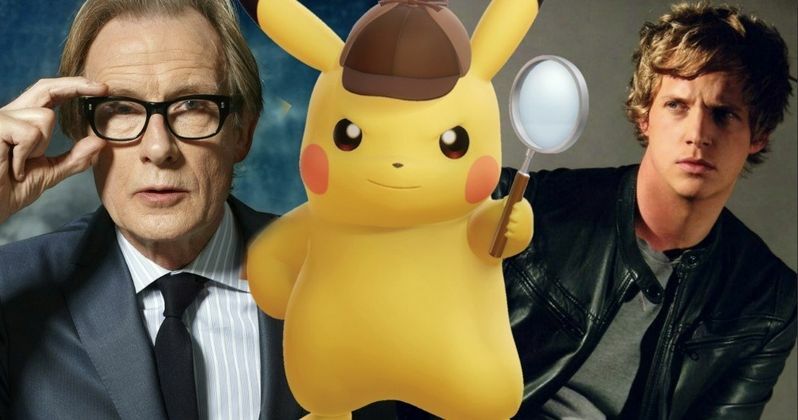 As production continues on Legendary's Detective Pikachu, two more cast members have been added, with Bill Nighy and Chris Geere coming aboard. No details have been given for either of these characters, or how big their roles may be in this story. This casting news comes just over a week after Detective Pikachu started production, and while the cast keeps getting considerably bigger, there is no indication as to how many other roles are still left to be cast. Bill Nighy and Chris Geere join a cast that includes Ryan Reynolds as the title character, who was on a Legendary short list for the role that also included Dwayne "The Rock" Johnson, Mark Wahlberg and Hugh Jackman. The cast also includes Justice Smith as Tim Goodman, who teams up with this peculiar Pikachu, who can actually understand humans and claims to be a great detective, to find his missing father. Kathryn Newton's character is said to be a "sassy journalist" who helps out this new duo on their first case together. We also reported earlier this month that the cast will include Oscar-nominated actor Ken Watanabe, played a brand new character named Detective Yoshido, who was not in the original video game. The original game also didn't include the story line about Tim Goodman's father being kidnapped, but featured this young boy and Detective Pikachu solving crimes around the city together. The game was first released in Japan for the Nintendo 3DS in 2016, although it was never released throughout the rest of the world. When production started this month, it was revealed that a Detective Pikachu video game is coming to the Nintendo 3DS family of systems early this year where the new Detective Pikachu character will be introduced, although it isn't clear if there will be any differences between this new game and the original release. Detective Pikachu will be directed by Rob Letterman (Goosebumps), who is working from a script originally written by Nicole Perlman (Guardians of the Galaxy) and Alex Hirsch (creator of Gravity Falls), with writers Tom McCarthy (Spotlight) and Erik Pearson (Thor: Ragnarok) coming aboard to perform some production polishes of the script. Mary Parent and Cale Boyter produce Detective Pikachu for Legendary Entertainment, while Joe Caracciolo, Jr. (Pirates of the Caribbean: Dead Men Tell No Tales, Logan) and The Pokémon Company's Tsunekazu Ishihara serve as its executive producers, while Legendary's Alexandra Mendes co-produces. Legendary Pictures has set a May 10, 2019 release date for Detective Pikachu, which could be quite troublesome for this upcoming adventure. It falls just one week after Marvel's highly-anticipated Avengers 4, which brings Marvel Phase 3 to a close. It will also be going up against another family-friendly franchise, STX's Uglydolls, along with TriStar's The Rosie Project, with Lionsgate's John Wick: Chapter 3 arriving on May 17, 2019 and Disney's Aladdin and Warner Bros.' Minecraft arriving on May 24, 2019. Bill Nighy will next be seen in Triple Word Score and Queen of the Mountain, while Chris Geere stars in the FX series You're the Worst. Deadline broke the casting news earlier today.